Who’s Afraid of Pink, Orange, and Green? Not Irene Schampaert or Iris De Feijter, the Belgian authors of a new interior design book that—as the playful title implies—aims to get people over their chromophobia. The tome, which spotlights 21 spectacularly pigmented homes around the globe, is aspirational—eye candy to the nth degree, for sure—but, moreover, it’s actionable, a manual that shares surprising ideas for where and how to introduce color (like a cherry red ceiling in an all-white kitchen) and suggests combinations that you’d never dream would work (hello, pistachio and deep purple). And while one or two of the featured spaces are true showstoppers, most are refreshingly accessible, like the one-bedroom in Brooklyn’s Williamsburg neighborhood that reads as a love letter to cobalt blue or the tiny Paris apartment where pops of Warhol banana yellow and pale pink paired with black walls offer an easy tip to try out. All this to say, bringing a little—or a lot—more color into our own homes is totally doable. For a sneak peek at our favorite saturated interiors in the book and the decorating lessons we learned from each, keep scrolling. Unsure how to create a cohesive color palette in your home? Pick out hues or patterns from an existing piece of furniture or wall art and replicate it throughout the room with textiles, window treatments, and even upholstered furniture. Here, the playful zigzag pattern on the rug alludes to the matching colorful prints of the artwork, which acts as the undeniable focal point of the room. When choosing paint colors, think beyond the confines of a single room. Two contrasting shades can still interact with one another while living in separate spaces. In this 1920s family home, designer Guillermo Santomà used technicolor tones, like cotton candy pink and emerald green, to establish a power palette within the space. Set the tone by designating an unexpected pop of color to the ceilings. It’s more affordable than splurging on decorative accents and textiles and adds a dose of color and personality. A muted shade of pistachio can be just as eye-catching and impactful as a primary blue or red. The trick here is to pair it with a complementary hue that still offers a touch of contrast. Think pistachio green and a muted yellow, or blush and a powder blue. 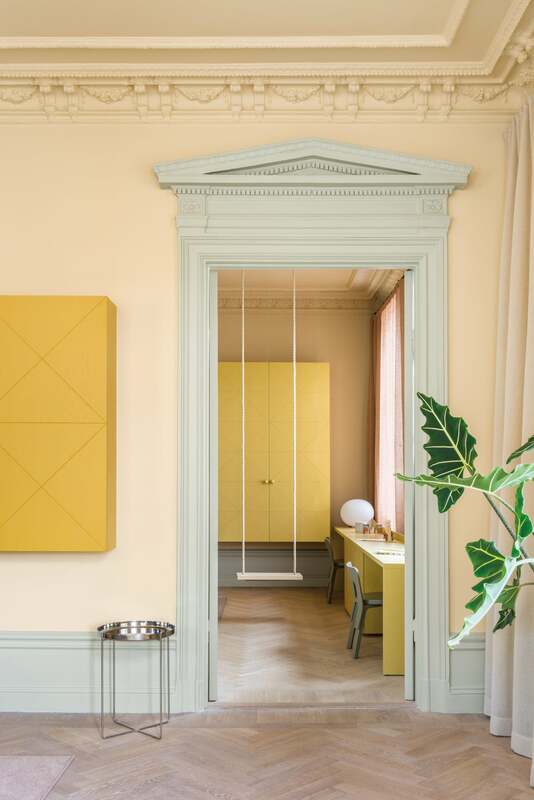 In this ornate space, a soft green, reserved for the molding, frames the muted yellow walls, resulting in a finish that pops. Instead of painting the walls in a single shade, get creative with pattern. Begin with a solid hue—preferably a neutral one—to establish the backdrop and try your hand at a Memphis-inspired print. Designate colorful stripes for the door to give it a playful dose of character. If you’re feeling bold, replicate the motif in various colorways throughout the room.